Her six arms are needed to save the being suffering along the six paths of existence(rokudoo 六道). She is also a protector deity for pregnancies, childbirth and the healthy growth of babies. 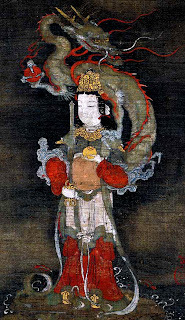 Nyoirin-Kannon, who fulfills the wishes of all living things, destroys delusions, and grants wealth, was an especially venerated by Japanese aristocrats of the Heian period (794—1185). Representations of this Kannon appear in the ancient Chinese cave temples at Dunhuang. Statues of Nyoirin-kannon were first made in Japan in about the eighth century and are of two kinds. The earliest ones have ordinary human forms—one face and two arms—and are seated with the right leg bent and the left leg hanging earthward. Later ones (as shown in the illustration) have one head and six arms and adopt a distinctive pose with one knee raised. Today, most statutes are of the second kind. One of the three right hands holds the Fabulous Jewel (nyoihoju　如意宝珠), one holds prayer beads, and the third touches the right cheek. One of the left hands holds the Wheel of the Law (rinpo　輪法) and another a lotus flower. The third is in the hand position (mudra) that Shakyamuni is said to have adopted when he attained enlightenment and destroyed the demons of the Earth: the open hand is pressed, palm down, on the ground. All Nyoirin　Kannon statues, no matter what their position, hold the Fabulous Jewel and the Wheel of the Law. According to one theory, the jewel is a modified form of the reliquaries used to hold Buddha relics. As faith in the relics spread, the reliquaries themselves came to be identified with their contents and were believed to grant all believers' wishes and to bestow wealth. The form of the Wheel of the Law is said to derive from a weapon the Vedic and Hindu god Vishnu threw to slice his enemies in two. In Buddhism, it expresses the way the Buddhist Truth crushes delusion and eliminates all suffering. The Jewel and the Wheel symbolize the benefits bestowed by Kannon. The honzon, or primary icon, of the Japanese Buddhist temple Kanshinji is a statue of the bodhisattva Nyoirin Kannon. Annually, on April 17 and 18, devotees flock by the hundreds to Kanshinji, located deep in the mountains south of Osaka, to pray to the temporarily revealed secret image. From a respectful distance they beseech the Nyoirin Kannon for blessings through the power of the "wish-granting gem" held in the innermost right hand of its six arms. Judging by the historical record and applying comparative stylistic analysis, art historians generally date the Nyoirin Kannon sta tue to about 840. 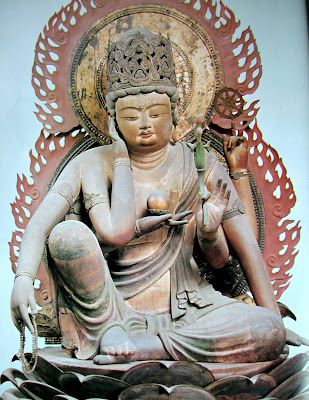 It is thus the earliest surviving Japanese representation of this particular bodhisattva, one of many Esoteric forms of the Kannon (Sanskrit: Avalokitesvara). ... a temple record dating to 883 shows that the Nyoirin Kannon image was originally but one icon among a group of statues and paintings made for the altar of the monastery's lecture hall.
. Hasedoo 長谷堂 Hase-Do Hall - Yamagata . The temple was founded in 1601 by the caretaker for the feudal lord Makino 牧野番内 at the Hasedo Castle, to place his precious seated statue of a Nyoirin Kannon, which had been made around 880 and was about 36 cm high 1尺2寸. It used to be venerated to grant eternal life in paradise and now is famous for its pokkuri sudden death prayers. kaerutera, kaerudera かえる寺　"Frog Temple" , "Frogs Temple" . Seiryu Gongen (Seiryo Gongen, Seiryoo Gongen). Early visions of Nyoirin Kannon reveal the way in which the "original substance" (honji) of a deity may serve as a mask of Buddhist orthodoxy through which the "manifest trace" (suijaku) speaks. Another version tells us that Kobo Daishi introduced this deity from China, adding the character of water to the character of dragon 「瀧」 . This deity is often invoked in rain rituals. She is the third daughter of the Indian Dragon Deity Shagara. She had been introduced to China in the temple Seiryoo-Ji, where later Kobo Daishi met this deity and introduced her to Japan. Zennyo Ryuou, a few survive at Mt. Koya and in Daigoji temple. This example is more like a visual essay examining two examples, one is the Mt. Koya version by Jochi, an artist monk (active 1120) and the other is a work done in the Kamakura era (13th century) version in Daigoji by another artist monk. the red line is the Daigoji mohon possibly done by Shinken in the Kamakura era. The one thing that is unclear and no records are found is that Jochi was also at Daigoji (of course a lot earlier than Shinken, Jochi's example is a painting, while Shinken's is a simple line drawing done in sumi ink. Research continues onwards if further material is written.
. Muro Ryuketsu Jinja 室生竜穴神社 . Click photo to see more ! Maybe Issa saw her on a stone under the cherry tree ? She is often depicted on stone monuments by the wayside. "Kannon mit dem magischen Rad, das die Begierden stillt". Mit dem wunscherfüllenden Juwel und dem Rad der Lehre rettet sie alle Wesen. Spendet weltliche und geistige Reichtümer. Siehe besondere Erläuterungen zum Juwel und dem Rad. Oft als Grabsteinfigur, dann meist in weiblicher Form auf dem Grab einer Frau. Seit dem 8. Jhd. in Japan bekannt, aber erst im esoterischen Buddhismus als Gottheit mit eigenen Zeremonien (Nyoirinhoo) zum Schutz vor Krankheit und Feuer verehrt. Seit dieser Zeit erst Statuen mit mehreren Armen. Entsprechende japanische Gottheit ist Seiryuu Gongen 清瀧権現 des Tempels Daigoji. Meist sitzende Figur mit einem Kopf. Anfänglich zwei Arme, seit der Heian-Zeit dann esoterische Form mit sechs Armen zur Errettung der Leidenden in den sechs Existenzbereichen, mit verschiedenen Gegenständen, z.B. dem wunscherfüllenden Juwel, Rad der Lehre, Rosenkranz, Lotusblüte u.a. Statuen mit vier, acht oder 12 Armen sind selten. Das Rad der Lehre wird manchmal auf dem erhobenen Zeigefinger der obersten linken Hand gehalten. Hohe Krone mit kleiner Verkörperung. Rechte Hand am Kinn, Ellenbogen auf dem hochgestellten rechten Knie; eine Hand in der Geste der Anrufung der Erde als Zeuge. Am deutlichsten durch das hochgestellte Knie zu erkennen, während das andere Bein in Meditationshaltung eingebogen ist; dabei berühren sich die Fußsohlen der beiden Füße. Entweder Lotussockel oder spezieller "Strahlender Berg"-Sockel (koomyoosan 光明山), mit überwältigendem Wurzelwerk, bei dem der Hersteller seiner Individualität Ausdruck und Gestalt geben kann. Mit einer Hand stützt sie diesen Sockel, damit der "Strahlende Berg" mit dem Lotussockel nicht ins Wackeln gerät. Eine Hand mit Lotusblüte und Rad der Lehre zum Himmel, eine zur Erde: "Alle Wesen zwischen Himmel und Erde sollen sich zum Buddhismus bekehren." Der Rosenkranz bedeutet: "Glaubt an den Buddha, findet den Buddhismus in Euren Herzen!" Hand am Kinn: Nachdenken, wie die doch nicht gläubigen Menschen gerettet werden können. Wunscherfüllendes Juwel: "Alle, die an den Buddha glauben, werden mit diesem Juwel und mit der Lotusblüte belohnt!" Nyoirin Kannon drückt also mit allen sechs Armen gemeinsam die Lehre des Buddha aus. Rechte Hand in nachdenklicher Haltung an der Wange: Bereich der Höllenbewohner. Rechte Hand mit wunscherfüllendem Juwel: Bereich der hungrigen Totengeister. Rechte Hand mit herunterhängendem Rosenkranz: Bereich der Tiere. Linke Hand auf dem Sockel: Bereich der Dämonen. Linke Hand mit Lotusblüte: Bereich der Menschen. Linke Hand mit Rad der Lehre: Welt der Götter. Very very nice--scholarly in an easily accessible way, artistic, and literary. Thank you for the comment, and the link--pure joy to read your post. This temple was founded in 1611 by 証円法印. The main statue is 如意輪観世音菩薩 Nyoirin Kannon. on behalf of 桂昌院 Lady Keisho-In (徳川綱吉 生母), the mother of Shogun Tsunayoshi. The main statue is 如意輪観世音菩薩 Nyoirin Kannon Bosatsu.